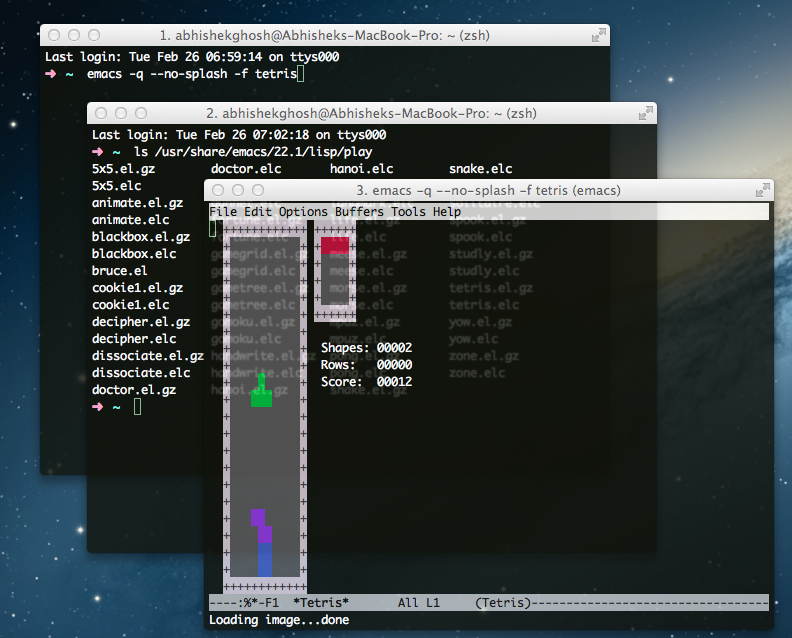 Play Games in Terminal the old good GNU emacs games in Mac OS X using some commands. Many games comes by default in Lion or higher like Tetris. You can add more emacs games for free of cost. We are showing the example with OS X 10.8.x. It is a nice feature and mostly unknown that these games exists in your Mac. Click Finder Icon on Dock > Click Applications > Double Click to Open Utilities > Double Click the Terminal to launch the application. We are using iTerm2 which you can also use if you follow this guide; iTerm2 looks better than the default Terminal. You need a basic idea about UNIX commands, you can follow this guide for some idea. For iTerm, the shell is zsh, by default it is bash. It does not matter which shell you are using. Game control is with Arrow Keys. This Article Has Been Shared 2047 Times! Dictation feature in OS X 10.8.3 with video guide shows how to activate and use Dictation software feature with Siri like icon.It Works Great With Apple EarPod. Cite this article as: Abhishek Ghosh, "Play Games in Terminal in Mac : Old Good GNU emacs Games," in The Customize Windows, February 26, 2013, April 19, 2019, https://thecustomizewindows.com/2013/02/play-games-in-terminal-in-mac-old-good-gnu-emacs-games/.